In the opinion of Gallant’s Case, issued December 29, 2017, the New Hampshire Supreme Court upheld the suspension of Attorney John F. Gallant from the practice of law. The case demonstrates the intersection between family law and criminal law. Attorney Gallant represented his former law partner whose ex-girlfriend obtained a restraining order against him. Attorney Gallant was later charged criminally with witness tampering based on an allegation that he told the ex-girlfriend that he “spoke to the judge yesterday” and “he doesn’t want to hear this [case]” and then asking her “can’t you just drop it?” or words to that effect. Even though he was an experienced attorney Attorney Gallant’s advocacy in this charged situation resulted in criminal charges against him personally and the suspension of his law license. Witness tampering is a felony and the statute prohibits, among other things, a person from attempting to induce someone he knows is a potential witness to testify falsely, withhold evidence, or to fail to come to court to testify. In family court cases there are often court orders restraining one party from contacting another party based on allegations of domestic violence. Further, allegations of domestic violence often result in criminal charges that can carry bail conditions that also restrict contact. Attorney Gallant’s partner was restrained from having contact with or abusing his ex-girlfriend when Attorney Gallant tried to convince her to drop her case. WHAT IF YOU WANT CONTACT? Time heals many wounds and parties who have sought such orders sometimes decide they no longer want to be apart, or desire communication with their former partners. If children are involved both parents may find it difficult to see their children unable to speak to the other parent because of this type of order. These stressful circumstances can lead to one party attempting to convince the other party to drop their domestic case, or to simply not show up in court as a quick solution to this type of perceived problem. Beware because witness tampering is a felony and can carry penalties of up to 3.5-7 years in prison! 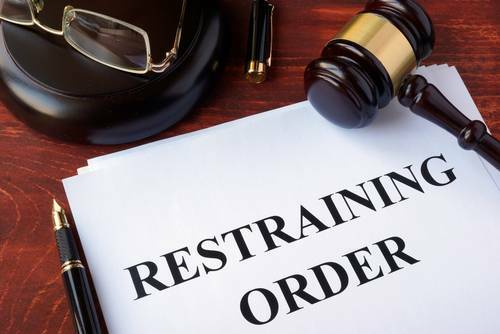 Any contact, even if initiated by the party who is being protected by the restraining order, can result in criminal charges at worst and contempt of court. The truth is that if you find yourself in a family case with allegations of domestic violence it can quickly turn into a serious criminal case. You should strongly consider consulting an experienced attorney before you try to navigate these treacherous waters.